Original Owner — Murphy, D. J. Original Owner — Edelin, John H.
Architect — Friedrich, Emil S.
Builder — Friedrich, Emil S.
Original Owner — Spencer, Wm. S.
Architect — Adams, B. B. Builder — Adams, B. B. Original Owner — Yost, J. C.
Washington Evening Star, 9 May 1891, p. 5. 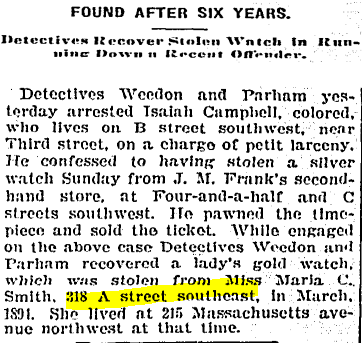 Washington Evening Star, 11 June 1891, p. 1. “In the World of Society.” Washington Evening Star, 2 December 1912, p. 7. “Deaths Reported.” Washington Evening Star, 11 March 1909, p. 7. “Building Permits for the Week $499,470, a Noteworthy Increase.” Washington Post, 2 April 1916, p. R2. “Died.” Washington Post, 8 June 1925, p. 3. “Police News Notes of a Day.” Washington Post, 21 November 1915, p. 19. Washington Post, 3 December 1911, p. R5. “Today in Washington: Applications for Marriage Licenses.” Washington Post, 12 July 1940, p. 33. 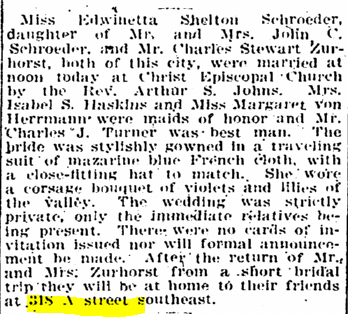 Washington Post, 15 November 1900, p. 12. 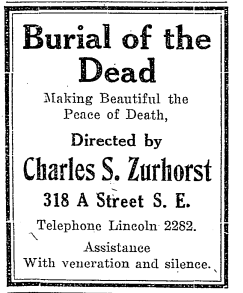 “Died.” Washington Post, 5 December 1915, p. 3.